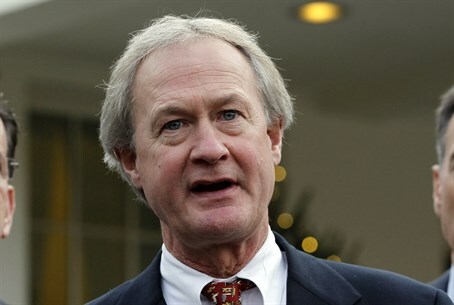 Former Rhode Island Governor Lincoln Chafee hopes to challenge Hillary Clinton in Democratic race. Former Rhode Island Governor Lincoln Chafee officially entered the 2016 presidential race as a Democrat on Wednesday, Fox News reported. Chafee cast himself as an anti-war candidate who opposed the invasion of Iraq back when challenger Hillary Clinton supported it. "We must deliberately and carefully extricate ourselves from expensive wars," he was quoted as having told a half-full law school classroom at George Mason University in northern Virginia. "We need to be very smart in these voluble times overseas." Chafee, a one-time Republican, officially left the GOP in 2007 and was later elected governor of Rhode Island as an Independent. He joined the Democratic Party two years ago, and has made little effort to set up a competitive campaign operation, beyond a few visits and calls to activists in the early voting states of New Hampshire, Iowa and South Carolina, noted Fox News. With his announcement, Chafee became the biggest longshot among Clinton rivals who have a long way to go to avoid becoming historical footnotes in the 2016 campaign, the network noted. In addition to Clinton and Chafee, other candidates for the Democratic nomination include Vermont Senator Bernie Sanders, the 73-year-old Jewish senator who officially launched his campaign earlier this month.